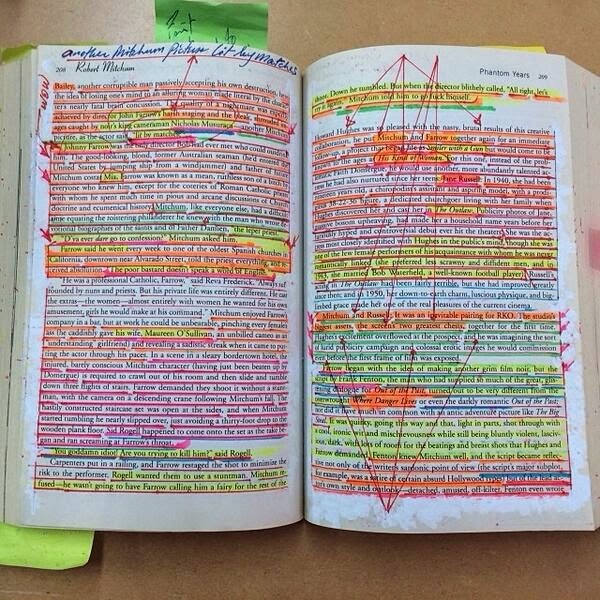 No, That Is Not DFW's Copy of <i>Ulysses</i>. It's Not Even <i>Ulysses</i>. It was easy enough to use Google Books to find a Robert Mitchum biography with this page layout: Lee Server's Robert Mitchum: "Baby, I Don't Care". I sent a Tweet to the person who originally posted this; I assumed he'd just been joking, as anything with a bunch of weird annotations could jokingly be called DFW's something-or-other. Though I don't know his motivations, this still seems the most likely explanation. That everybody immediately and without any research assumed it was true and not a joke was ... illuminating. I continued to wonder what the book was, though, and why someone had ... decorated it ... in the way they had. I didn't have time to track it down, but Bibliokept did, and came up with some interesting stuff. Check out that link — it's a fun detective game. The image is still compelling and fascinating, despite not being a book of DFW's nor a copy of Ulysses. In some ways, it's more impressive that it isn't a complex text like Ulysses, but just a popular biography of a movie star. What are the lessons here? 1.) Don't believe everything you see on the internet. 2.) Sometimes things are even weirder than they seem at first.